What do you like to douse with ketchup -- burgers, hotdogs, chicken, French fires or maybe steak? Tomato ketchup, or catsup if you prefer, is a nineteenth-century condiment creation—the marriage of the English tradition of fruit and vegetable sauces and the growing American love-affair with the tomato. You’ll be the hit of any backyard barbeque when you show up in a larger-than-life Ketchup costume. Don’t let the anticipation of a Ketchup costume make you wait. Pour yourself into a hysterically funny Ketchup bottle and make your entrance as a “little squirt”. 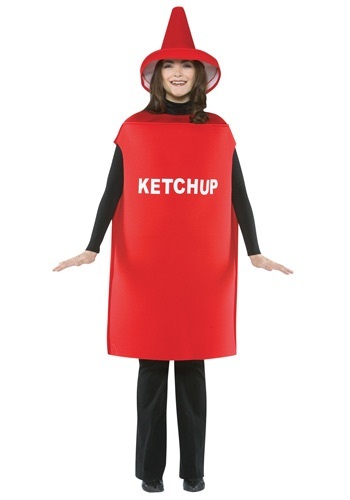 With a bright red sheath labeled “Ketchup” and a cone-shaped and brimmed hat that looks just like a condiment bottle top, your Ketchup costume will undoubtedly be the most flavorful and favorable look of the get-together. For a tasty team, invite a friend to join your Ketchup costume debut in a coordinating Mustard bottle costume! If you’ve got another friend, he can come along as the Hot Dog! 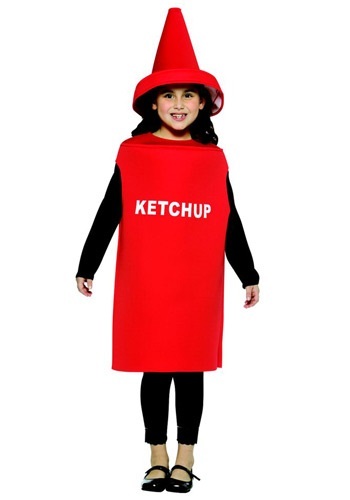 Get your Ketchup costume today!